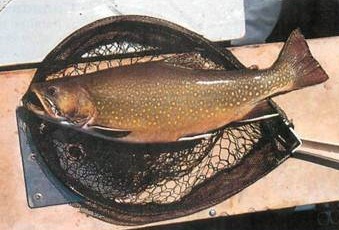 The laker is in fact a char, but it has been dubbed the ‘lake’ trout because of its resemblance to the brook trout. It can weigh up to 100lb (45kg) and the IGFA record is for a super 65lb (29.4kg) laker, taken by Larry Daunis from Great Bear Lake in 1970. 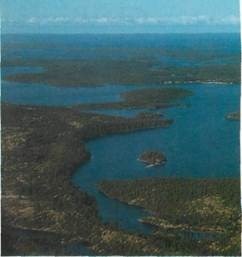 The lakes and forests of north-eastern Manitoba to fish for brook trout. The spectacular scenery, coupled with Canada’s outstanding fishing, draws anglers from all over the world. Jon Beer wrestles a grayling from waters of Nueltin lake. 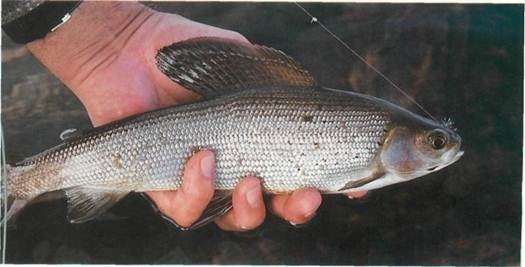 Often, as a beautiful 2lb (0.9kg) grayling is drawn towards the net, it is followed by the ominous shark-shadows of the large lake trout – or laker – cruising the narrows. 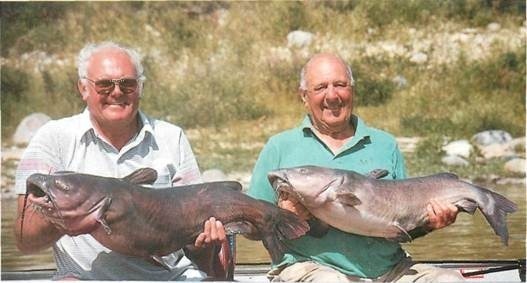 Catching channel catfish like this splendid pair is an experience in itself. With the help of famous catfish guide Stu McKay, and a proven bait, it wasn’t long before Jon was doing battle with one of these 20lb (9kg) Red River residents. Manitoba’s catch limits but at Red River – a water known mainly for catfish and walleye – there are carp specimens aplenty. In the oxygen-rich waters of Nueltin lake these grayling behave like rainbow trout, rattling through the shallows and leaping from the water.In some places Nueltin lake is choked, becoming a series of channels where the water runs swiftly over shallows. 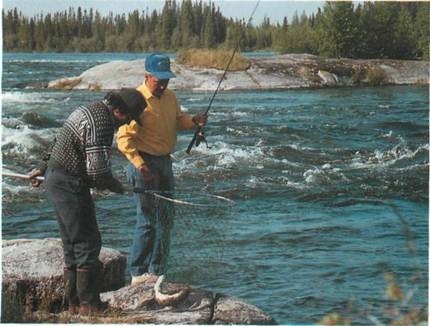 Here a fine laker is admired by angler and Chippewyan guide alike. This brook trout was eventually taken from the tumbling white waters of God’s River. Much praised as a fly rod phenomenon, these sporting fish provide a glittering prize – but as Jon found out, they can be a temperamental and even downright stubborn species. The ‘barrenlands’ is a vast mosaic of lichens, mosses and crystal-clear waters stretching from the southern reaches of Canada’s North West Territories up to the Arctic coast. It is also the land of the lake trout, also called the laker. In the chilly wastes of the barrenlands, at the northerly tip of Nueltin lake, these magnificent predators can be found at all depths – even in the thunderous rapids away from which our Chippewa guide had just steered our boat. Once we were clear of the drenching spray I cast into the edge of the current of this large backwater. 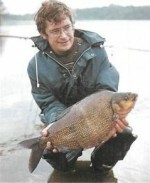 My rod heaved down under the onslaught of a laker – about five or six pounds (2.2-2.7kg). A second cast… and a second, bigger fish. I played it carefully into the slacker water. In the ten minutes it took me to subdue the hard-fighting, almost double-figure laker, my companion Terry Smith had landed and released five more. 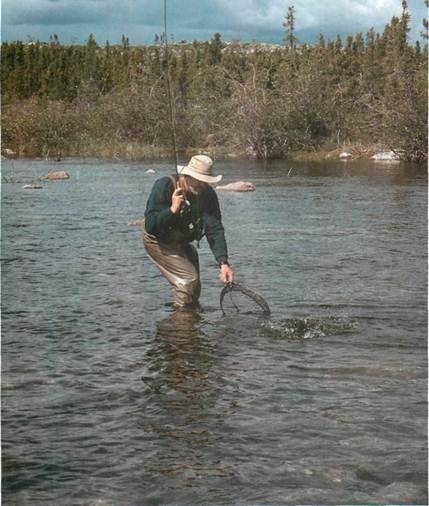 I had never seen fly-fishing like this — but then trout fishing in Canada isn’t always like this! A hundred miles farther south, nestling in the stunted pine forest beside the pure and seemingly limitless waters of the lake, is Treeline Lodge. It’s a ‘fly-in’ fishing centre that operates for the three short months of the year that this land is free of ice. In the winding channels between the many islands that infest Nueltin’s waters, the laker lies much deeper. Here we were trolling 15cm (6in) spoons, searching the depths with downriggers and diving vanes. The ferocity of the take could be felt right through 30m (100ft) of 15lb (6.8kg) mono and my muscles ached as I fought a massive 25lb (11kg) laker through the sunlit depths. The fast flowing sections of this water are also home to some exquisite Arctic grayling that sip at the carpet of flies funnelled into the narrows. To cope with them we swapped our powerful salmon rods for light dry fly tackle. Within minutes several fair-sized grayling – with all the acrobatic qualities of a rain bow trout – had been tempted from, anc returned to, the crystal waters. We didn’t do all our fishing in the vast emptiness of the north. Red River flows through the city and suburbs of Winnipeg, the capital of Manitoba, before feeding the inland ‘sea’ of Lake Winnipeg. One stretch of the river, below the dam at Lockport, is famous for another species -the channel catfish. Like our European wels, this catfish has a huge mouth, whiskery barbels and smooth skin – but it is not a nocturnal sumo wrestler of the muddy lakes. This channel cat prefers deep, cool rivers where it fights hard and fast, tearing line off the reel. 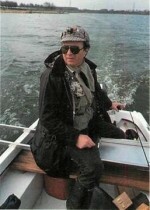 Fishing at Lockport means fishing with legendary channel cat guide Stu McKay. With Stu in charge we headed up to the crashing waters of the dam, anchoring within the spray at the bottom. We were not fishing alone at this spot – a flock of pelicans was dipping and rising behind the boat. Our tackle was simple enough. We fished a meaty bait — steaks of frozen goldeye – on a long leger among the rocks below the dam. The fishy steak was securely hooked and cast to swirl in the turbulent waters. You wait… there is a steady draw… then you strike, bending into 20lb (9kg) or more of dogged determination that has you sweating in the steamy heat of the Red River in summer. The Red River was a respite. Our next stop was God’s River in north-eastern Manitoba. In the winter a 300-mile ‘winter road’ is marked out on the ice and frozen land, crossing the region’s maze of lakes and rivers. When the ‘road’ thaws in the spring, the only way in is by air. 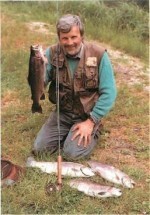 God’s River is renowned for its trophy brook trout. Like many other eye-catching beauties, the brookie is a creature of many moods. When it feeds it can take anything and sport on a fly rod can be fast and furious. But when it turns peevish it lies deep and dour. The brookies were obviously in a foul mood because not one of them rose to any of our flies on our 30 mile search of the tumbling white waters. We put away the fly rods. Clearly, something rather more powerful was required here. Fishing a large Mepps between the boulders and eddies did the trick, resulting in a ferocious take. The line wrenched and a fish hurtled into the strong current — a 6lb (2.7kg) brookie doesn’t come meekly. Although the brook trout were not taking flies, other fish were. In a calm pool of the river a large dorsal fin broke the surface and waggled insolently — and others erupted nearby. Hatching olive-winged drakes (an American mayfly) were being thoroughly vacuumed by a cruising shoal of whitefish. Whitefish make superb eating but are hardly regarded as sporting fish in this land of ‘he-man’ lakers and brookies. Our expedition was nearly over but there was still one more surprise to come. We returned to the peaceful, almost suburban waters of the Red River. As we pottered along the reedy margins of the river, Terry heard a familiar sound. The water rocked as a fish slurped. 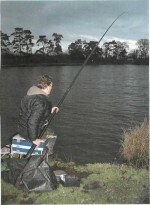 We looked closer and realised that the margins were alive with feeding carp! I am no carp fisherman. 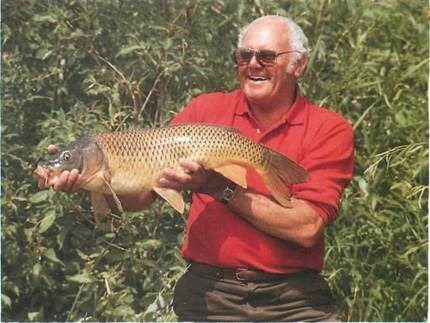 In fact I had never, ever caught a carp. But here I was, spending my final afternoon in Canada sitting on Stu McKay’s boat dock… fishing for carp with sweetcorn on a sliding waggler. 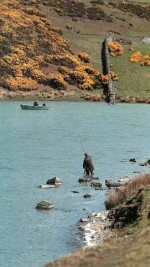 By six o’clock that evening I’d taken 20 lean, hard-fighting carp, to an ounce or so under 20lb (9kg). Not bad for a beginner.